Running is one of the oldest types of exercise around. Before gyms and Zumba classes existed, if you wanted to get fitter or lose weight, you went for a run. Athletes from all sports include at least some running in their workouts, and it’s also a popular competitive sport in its own right. Running isn’t for everyone, and walking (my walking guide here) is a good choice if you prefer a slower-paced workout. But, if you are looking for a simple but more demanding way to get fit and control your weight, walking is a very good option. In this guide I want to introduce you to the joys of running! Running is very simple, and you don’t need any special skills or athletic ability to get a lot from it. But, if you are a non-runner, it’s important you don’t make too many mistakes early on or you might put yourself off running forever. You might even hurt yourself. Here are three basic rules every new runner needs to follow. Running too fast when you aren’t used to it will leave you very tired and out of breath. If you run too fast, you’ll soon have to stop (that’s why I started slow, my running story here). For that reason, it’s very important that you set your own pace – what I call comfortable pace. A comfortable pace is just like it sounds. You’ll be slightly out of breath and you’ll feel warm, but you should be able to keep going for quite a long time. You can run faster as you get fitter, but you should always feel comfortable. The 10% rule stops you from running too far, too soon. If you increase the distance that you run too soon, you’ll end up sore and tired, and possibly injured. Running is quite stressful to your joints so it’s important that you increase that stress gradually. This is best done by applying the 10% rule to your workouts, which has two parts. A) Never increase the length of any single run by more than 10%. So, if you run two miles today, you should not run more than 2.2 miles next time. B) Never increase your weekly running distance by more than 10%. If your running total for the week is ten miles, next week you should run no more than 11 miles. In our walking guide, I explained what walking is a gentle type of exercise that you can do almost every day without getting tired or hurt. Running is more demanding and takes a lot more out of your body. Subsequently, unless you are very experienced, you should only run 3-4 times per week. This will give your body chance to recover from your workouts. If you want to do more exercise, do some walking on the days in between runs, and never be afraid to take an extra day off if you feel like you need it. Remember, the best type of exercise is the one that’s sustainable for months and years at a time. If you run seven days in a row for a week, but then have to take the next two weeks off to recovery, you’ll lose more benefits than you’ll gain. Despite being a simple activity, it can be hard to know where to start running. Follow these tips to help make your first few runs as easy and enjoyable as possible. 1. Slow and short – your first few runs should be really easy. Make sure that they are slow enough and short enough that you finish them feeling like you could have done more. If your first run leaves to regretting starting, you won’t want to go again. 2. Walk and run – one easy way to get into running is to alternate it with walking. For example, walk for two minutes and then run for one. Keep doing this until 20 minutes or so has elapsed. As you get fitter, try to walk less and run more. After a few sessions, you’ll be running the entire way but without doing too much, too soon. 3. Follow a variety of routes – doing the same run route over and over will soon get boring. Try and plan a few different routes and use them in rotation. That way, you can choose the route that suits your mood. Keep things interesting by jumping in your car and driving to new places so you can run a different route, such as a nearby park. 4. Run a day, rest a day – you’ll enjoy your runs a lot more if you aren’t tired from your last one. Because of this, most new runners should follow a day on/day off running plan. This will give you time to recover from your last run and make sure you have plenty of energy for next one. 5. Run with a friend – if you have a friend who is the same level of fitness as you, why not start running together. They’ll be good company and you can help keep each other motivated. Also, you should be able to chat to them while you run – albeit haltingly. If you can’t talk at all, you are going too fast. On the other hand, if you can talk constantly, you aren’t going fast enough! Use these tips to make your first few runs as safe, effective, and enjoyable as possible. How far and how often should you run? That’s a good question! Do too much too soon and you could end up tired, injured, and sore. But, take things too easy and you won’t get any fitter. To help you make the transition to regular running, I’ve created a four-week running plan that will make your first month of running enjoyable and rewarding. Before you start running, it’s important you warm up your muscles and joints. Otherwise you could injure yourself. It also takes a few moments for your heart and lungs to get in synch with your legs, making running initially uncomfortable. A warm up will help make the transition from sedentary to exercising much easier. Walk briskly for five minutes to warm up your heart, lunges, joints, and muscles. Gently stretch your calves, quadriceps (front thigh muscles), hamstrings (rear thigh muscles), and hip flexors (front hip muscles) for about 30 seconds each. Once you have done this, you should feel ready to run. Feel free to do some extra walking, stretching, or yoga on your rest days. This will help keep your muscles loose and limber and may even boost your recovery and running performance. As with the beginners walking plan I produced for our walking guide, this plan focuses more on time than it does distance. That’s because your comfortable running speed may differ depending on your fitness and your stride length. Some runners can do a mile in ten minutes, but someone else might take 20. Prescribing workouts by time means this isn’t an issue. Just run as far as you comfortably can in the time stated. Out and back runs work best. For example, if the plan says you need to run for 14 minutes, run out for seven minutes, and then run back again. Simple! Update: Looking for a workout plan for weight loss ? Check out our Beginners Running Plan for Weight Loss here. Once your workout is finished, you may be tempted to collapse on the sofa or head straight to the shower – big mistake. Instead, finish your run with another five-minute walk so your heart and breathing rate slows down gradually. Once you have finished walking, repeat the stretches you did at the start, spending extra time on any muscles that feel tight or sore. Once you have cooled off, make sure you drink some water to replace lost fluids. That’s especially important if you didn’t use a hydration pack so you could drink while you are running. I’ve owned lots of pairs of running shoes over the years. Some I’ve loved instantly, others have grown on me, and others I’ve hated. But, with every pair I have owned, I’ve learned a little more about choosing the best running shoes. For example, I soon discovered that very expensive shoes are not always better than more modestly-priced shoes, and that whatever the manufacturers tell you, the design of a running shoe won’t make you run further or faster! I also soon learned that the most important thing to look for in running shoes is comfort. If your running shoes hurt your feet, you won’t want to wear them. Here are three of the best men’s and women’s running shoes. Find more running shoes and reviews in more detail on my article Best Running Shoes for Women and men. These New Balance Running Shoes have a lightweight mesh upper, with a reinforced toe box to reduce wear. Like all New Balance shoes, they are available in a range of widths, so you will have no problem finding the perfect shoe for your feet. Available at Amazon.com. These shoes look like professional athletic shoes and that’s why a lot of top runners wear them. This pedigree comes at a price which is why New Balance running shoes are some of the most expensive on review. The Skechers running shoes are made from lightweight mesh and have good shock absorbency making them ideal for heavier runners, and those who tend to do all their running on pavements. These shoes have no reinforcement on the stress points, so they may wear out relatively quickly, but that means they are very light and soft, so they should be super-comfortable. They are not really suitable for off-road use so make sure you consider where you will be running before buying. If you want to run off-road, you’ll need something more rugged. Asics use a special gel in their soles to maximize shock absorbency. Shock absorbing shoes are often heavy but that’s not the case with their ASICS Women’s Gel-Nimbus 19 Running Shoes. The gel isn’t just in the heel either but in the forefoot too. This makes them extra comfortable if, like me, you run more on your toes than your heels. Asics shoes have the reputation of being hardwearing which is good as they aren’t that cheap. These shoes have a mesh upper that is reinforced in all the right places to reduce wear and tear. The soles are rugged enough for light off-road running but are best suited to pavement pounding. They use gel technology in their soles to provide great cushioning but with minimal weight. Tesla sports shoes are a very budget-friendly alternative to the more expensive well-known brands. 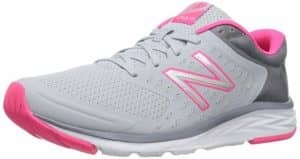 Available in a wide range of colors, these lightweight mesh-upper shoes are breathable, have a grooved outer sole for flexibility, and have good cushioning. While the mesh upper is light and breathable, it is prone to wear and tear, so these shoes will not be as long lasting as some other models and brands. That’s not an issue for a few short runs per week, but if you run a lot, you’ll wear your shoes out pretty quickly. New Balance Men’s Hierro V3 Fresh Foam Trail Running Shoe are made for off-road use. That means they are tougher and heavier than the average road running shoe. They have a booty-type construction which means they’ll fit you like a glove, or should that be sock? They are very hardwearing, and suitable for more adventurous running. Don’t worry though, they’ll be right at home on the pavement too. If you want a pair of running shoes that you can wear almost anywhere, and don’t mind the hefty price tag, these New Balance Men’s Hierro V3 Fresh Foam Trail Running Shoes will be ideal. 1. Run lightly and quietly – running is a simple activity but a lot of runners I see don’t do it very well. They pound the pavement like it just insulted them, wasting a huge amount of effort in the process. Not only that, all the pounding is not good for your feet, ankles, knees, hips, of lower back. Running is hard enough on your joints without making it worse. Instead, when you run, try and land as lightly as you can so you make next to no noise. If you can hear your feet slapping on the floor you aren’t running economically or efficiently, and you are wasting a lot of energy. 2. Dress in layers – on cold days it can be tempting to wrap up warm. However, after just a few minutes of running, you’ll soon start to feel hot and uncomfortable. For this reason, make sure you dress in layers so that you can vent as you get warmer. A running top with a zip is perfect so you can undo it and take it off easily if necessary. A light hat and gloves can also be useful on really cold days but be prepared to take them off and put them in your pockets as you heat up. 3. Relax! – a lot of runners I see are way too tense. Their arms are tight, their hands are clenched, and the shoulders are hunched. What a lot of wasted energy! Don’t be like them. Instead make sure your arms, shoulders, and hands are loose and relaxed. Focus on breathing slowly, deeply, and regularly, timing your breaths to your footfalls. The more relaxed you are, the less energy you’ll use, and the easier your runs will become. The hardest thing about starting running is getting off your couch and heading out the door! Once you’ve achieved this feat, the rest is relatively easy – at least until the next time you are due to run that is! Running itself is straight forward. After all, if you follow my advice and only run at a comfortable pace, it should never be too hard or painful. Combine comfortable pace with running one day and resting the next and you have the perfect beginner workout plan. Just increase the distance of each run by a minute or two per workout and within a month you could be ready for your first 5k! All that being said, there are certain groups who need to take extra precautions to make sure running is as safe and effective as possible. If you have never really done much running, or it’s been a long time since you ran last, you are a beginner – even if you do other types of exercise. Beginners MUST start slowly, increasing speed and distance very gradually. Doing too much too soon could make you tired or sore and could even cause an injury. I want you to finish each of your runs feeling like you could have done more. That way you’ll never do more than your body can handle. Being older means you won’t recover so well from strenuous exercise. Also, your joints are more likely to be a little worn, and your muscles may be tight. Because of this, you MUST listen to your body and adjust your workouts based on how you feel. If you need an extra day of rest or feel like you want to do a little less, that’s okay. If you force it, you might end up injured. Also, because health risks increase with age, if you are new to running, it’s worth speaking to your doctor before you start to make sure he’s happy with your new exercise plan. He probably will be but it’s always worth checking. If your last workout is a distant memory and you are really out of shape, running may not be the best type of exercise for you right now. It could be too much, too soon. In this instance, I suggest you try walking instead. Once you have graduated from our beginner walking plan you should be ready to give running a try. Of course, you could just jump into running but I don’t recommend it. It’s better to take it easy, walk for a few weeks, and then try running once you have developed a bit more fitness. A walk-run program would be another good way to ease into running if you are out of shape. When you run, your feet hit the floor with something like eight-times your bodyweight. That’s a lot of force if you weigh 120 lb. but even more if you weigh 200+. Because of this, running might not be a good idea if you are very overweight. It’s going to put too much stress on your joints. If you are heavy, lose weight through walking, intermittent fasting, and eating healthily. 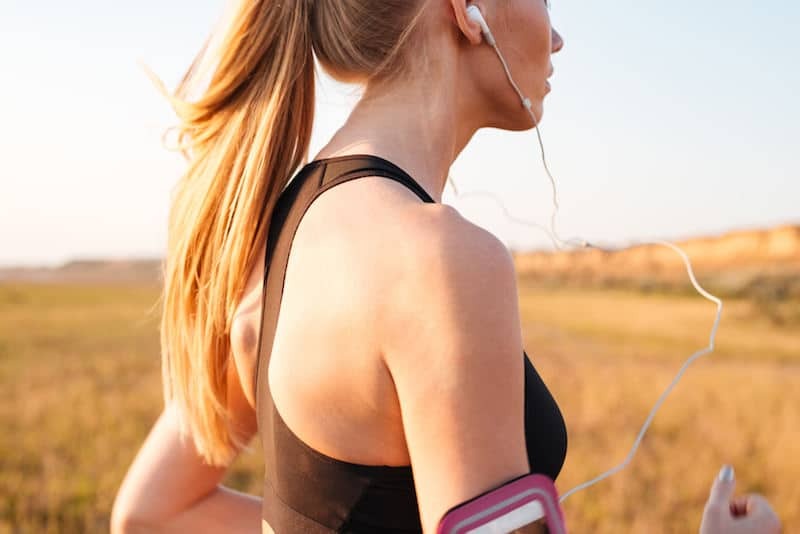 Once you’ve dropped those extra pounds, running will be much easier and loads more comfortable. Running is a great form of exercise and it’s great for your heart, lungs, and legs. However, there are exercises you can do that will make you a better runner. Running is a simple but complex activity. It’s simple because it’s straightforward to do, but it’s complex because it involves almost your entire body working at the same time. Here are three exercises that will help make you a better runner. Do them 2-3 times a week on your rest days to boost running performance. Kknee and hip instability can cause real problems for runners. If your knees or hips drop in or out of proper alignment, your joints will take a hammering. Squats with a booty band will help strengthen your glutes, making your hips and knees stronger and more stable. Put your booty band around your knees and step out so your feet are shoulder-width apart. Push your knees out against the band. Bend your legs and squat down until your thighs are roughly parallel to the floor. Stand up and repeat. Do 2-4 sets of 12-20 reps. Surprisingly, your abs have to work quite hard when you run. They help keep your midsection rigid and your spine properly aligned while you run. Because of this, strengthening your abs is a good idea, but not with crunches! Instead, do the quadruped exercise for running-fit abs. Knee on all fours with your hands under your shoulders and your knees under your hips. Extend one arm and your opposite leg while keeping your hips and shoulders level. You should feel your abs contract hard. Lower your arm and leg, change side, and repeat. Do 2-4 sets of 8-12 reps per side. Your calves are important muscles for running, but they are also muscles that we seldom exercise. That’s why calf strains are very common in runners. Strengthening your calves will improve your running performance while reducing your risk of injury. To do this exercise, stand on the edge of a step so that your heels are free to move. Keeping your legs straight, lower your heels as far as possible and then rise up onto your toes. Do 2-4 sets of 12-20 repetitions. Too easy? Do one leg at a time. Most people who exercise do so for weight control. If you go to any gym, you’ll see people who are overweight working out to burn fat. Running is just one of many exercises that burn fat. When you exercise aerobically, which means with oxygen, your body mostly burns fat. Cycling, swimming, walking, and group exercise classes like Zumba are other examples of aerobic exercise. Aerobic exercise is REALLY good for your heart and lungs, as well as your other muscles. Most experts agree that you should work up to doing at least 20 minutes three-times a week for best results. This amount of exercise has been shown to be a very successful way to not only build fitness, but also lower the risk of diseases like diabetes, heart disease, and even cancer. But, what if fat loss is your main goal? What can you do to make sure you burn as much fat as possible? Here are a few tips that may help. 1. Fasted running – running in a fasted state may lead to faster fat loss. Why? When you are fasted i.e. first thing in the morning and 8-12 hours after your last meal, muscle and liver glycogen levels are depleted. Without this source of energy available, your body has no choice but to use more fat for fuel. Some people find that fasted exercise is much harder than exercising after a snack or meal. If you are one of them this tip is not for you. But, if you are okay exercising on an empty stomach, doing so could mean you lose fat faster. Try it and see if it works for you. 2. Pre-running caffeine – studies show that consuming caffeine before exercise may increase fat burning. Caffeine is a lipotropic agent which means it makes fat cells more mobile and easier to use for energy. A cup of strong coffee 15-30 minutes before you exercise is all you need to unleash the power of caffeine. As an added benefit, coffee and caffeine have also been shown to boost exercise performance. Skip the sugar and cream though! 3. Drink water – water is crucial for just about everything that happens in your body. Just a few days without water will lead to death. Water makes up about 95% of your blood, and when you exercise, sweating and exhalation can lead to some of this water being used up. This makes your blood thicker and harder to pump around your body. This is called cardiac drift and is one of the reasons you get tired during a long workout. If you become dehydrated, your workout performance will suffer, you’ll have to stop sooner, and that means you’ll burn less fat. Avoid this problem by drinking plenty of water before your run, and preferably during you run too. I use a hydration pack which is a wearable water bag that allows you to carry water and drink without having to use your hands. It’s the best way to stay hydrated while exercising. You can read more about hydration packs in my recent review article.